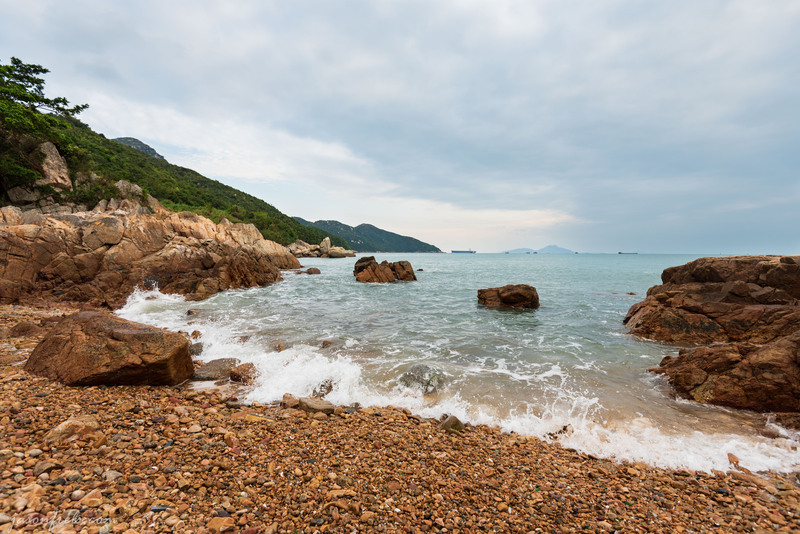 One hike that I read good things about when looking into Hong Kong, was the paths on Lamma Island. I read that it would not be crowded at all and there would be nice scenery and beaches. 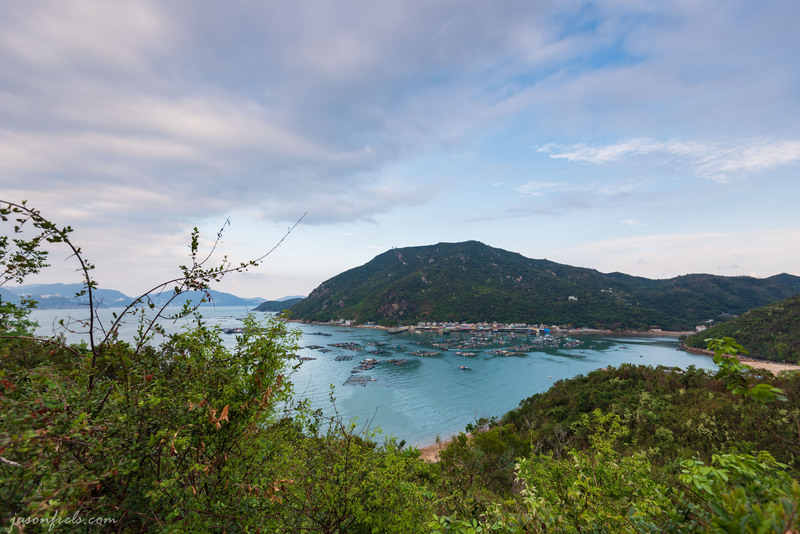 Lamma Island is a bit south of Hong Kong island and is quite a bit smaller. I don’t think that there are cars there; mainly paths for bikes, golf carts, and walking. 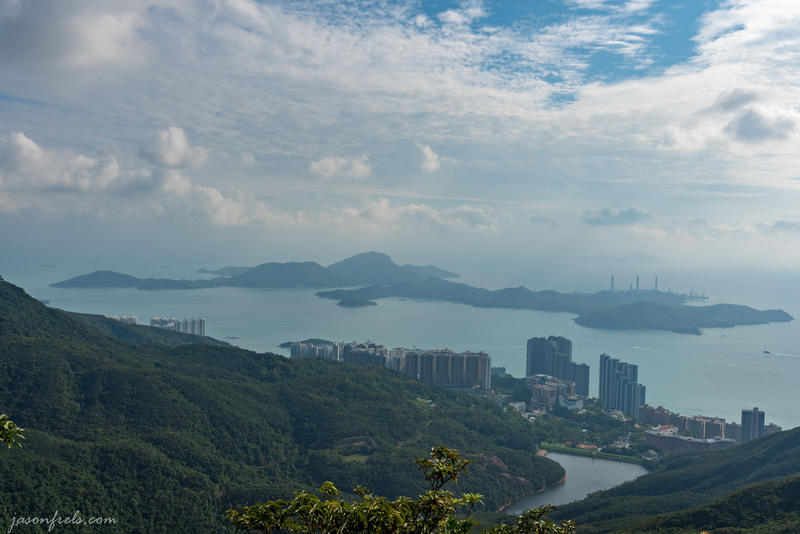 Below is a photo that I took of Lamma Island from Victoria Peak on Hong Kong Island. You can see the smoke stacks of the power station. 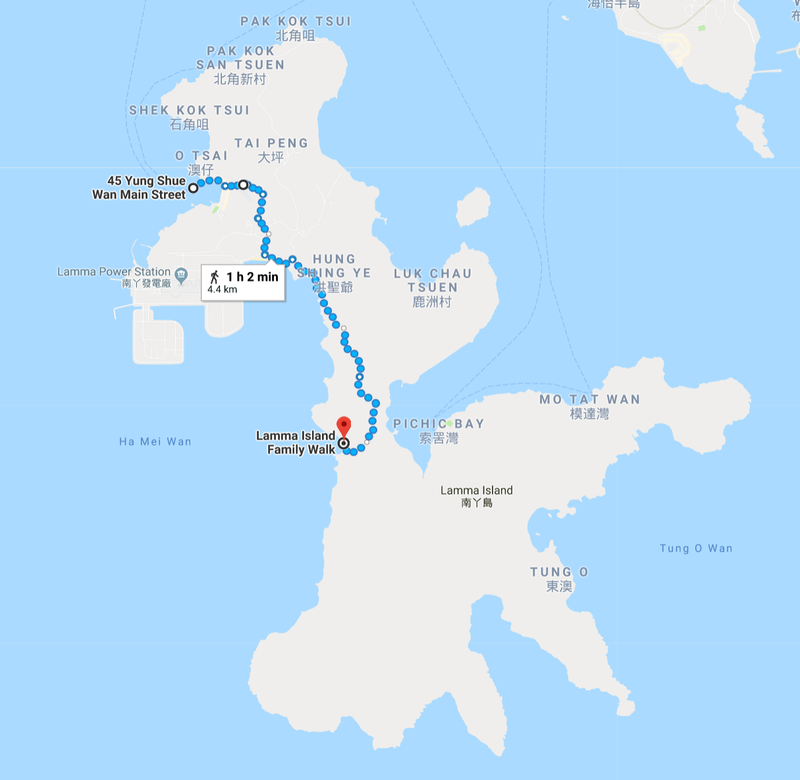 So, I researched a bit and found that it would be easy to catch a ferry from the central ferry pier in Hong Kong to Lamma Island. The ferry was a nice 30 minute ride and very affordable at HK$17.80, which is about US$2.27, each way. Below is an map of Lamma Island showing the approximate path that I hiked and back. Much of this distance was up and down hills. It was a very nice walk and there were very few people around, which is kind of what I like. The first place that I stopped and admired the view was at the beach near the power station. I was one of three people on this particular beach, so I could walk around shoot photos of whatever I wanted without bothering anyone. There were a lot of stones on the beach and I attempted to line up with some stones pointing to the horizon away from the power station. I set up this composition and went to my backpack to grab my ND filter and make this a long-exposure image to catch the waves retreating down the sand. 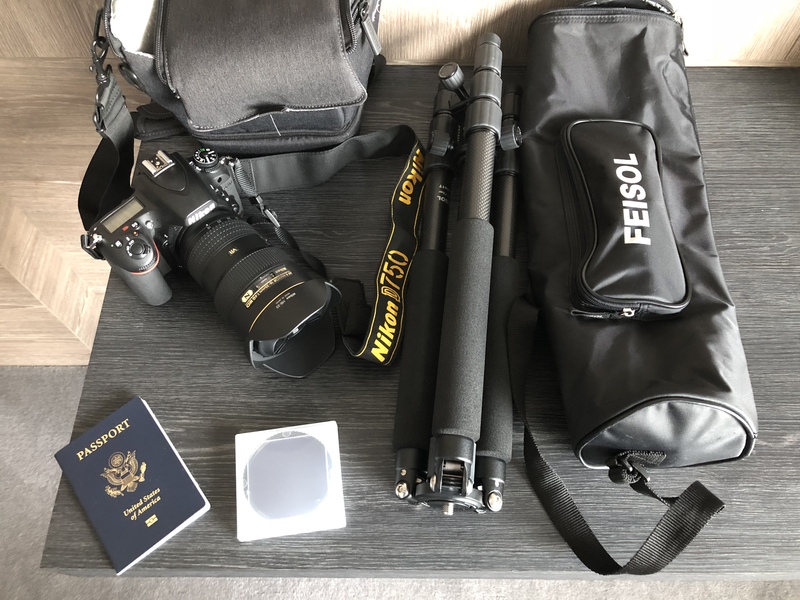 But, the goof who packed my gear forgot to include my ND filter; sigh. It was mostly cloudy as usual. I warmed up the sand a bit in Lightroom to reflect what the scene actually looked like. I did actually try taking 32 exposures to merge in Photoshop to make a virtual long-exposure, but I was not happy with the way this turned out. Farther along the hike, I came to an scenic overlook of a village along the shore. I thought that it would photograph well with the blue water in the foreground. You can see Hong Kong Island in the distance. I think that the town is called Pichic Bay. I tried zooming in a bit, but I found I liked the above composition the best with more of the landscape in the picture. I could have hiked around to this town, but decided on a beach farther down the path. 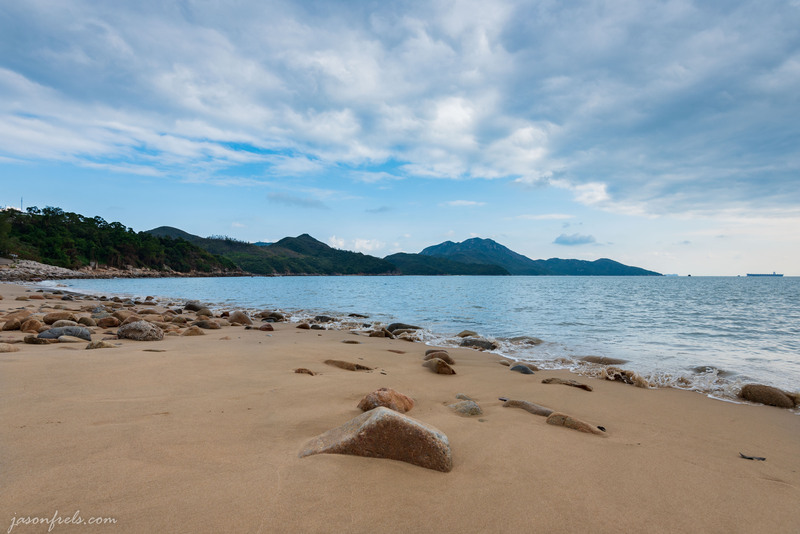 The last place that I hiked to was Lo So Shing Beach. Another nice beach with almost nobody in site. There was a couple there enjoying the afternoon and there was me hiking around. I went out to a point sticking out in the water and I saw some boulders that I wanted to try to photograph. I tried to time photos to get the waves breaking over the rocks to get some action. After this, I had to hike back to the ferry pier. I was hoping for a nice sunset, but the clouds were growing thicker and I had some concern that it might rain on me. I made it back to the ferry dry. There are shops, restaurants and bars along the way and it is important to know that they take cash and cash only. I rode the ferry back to the Central Ferry pier in Hong Kong and decided to just walk to the hotel from there (about 20 minutes). I found Hong Kong to be a very walk-able city. I did also take the subways a few times when going to Kowloon. Looking at my pictures, I almost could have gotten along with a 16mm prime. Looks like a nice hike. Love Hong Kong & cant wait to go back one day!